AITA is proud to partner with NAPA Auto Parts, the most respected and comprehensive parts company in the industry. Our partnership guarantees that you will save on virtually every purchase made at a participating NAPA location. If your local NAPA store is not a participating AITA member, please encourage them to become one - it will bring benefits to the store as well as to you. 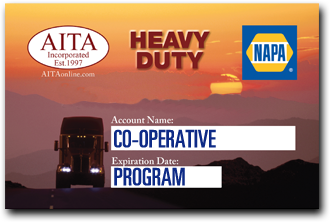 NAPA offers AITA Affiliates and Members a discount program for Fleets, known as the "AITA Legacy Program" as well a program for Individual Truckers known as the "AITA Cooperative Program," where one truck is all you need. 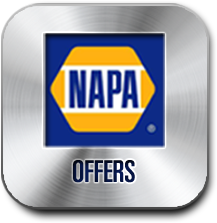 Discounts: AITA Affiliates will receive preferred National Account profile pricing at NAPA Auto Parts Stores, reducing your daily acquisition costs and saving you money in operating and maintenance expenses. Rebates: AITA Fleet Affiliates can earn volume rebates for their NAPA purchases; certain purchase minimums apply and the rebates are paid on all qualifying purchases from NAPA. The rebates are distributed by NAPA approximately 30 days after the close of the quarter and are identified as "NAPA - AITA Rebate Program," thereby decreasing your actual price of goods. Inventory Control: AITA Fleet Affiliates can take advantage of the NAPA stocking program featuring obsolescence protection, overstock protection, line changeovers and other features that allow the Affiliate to operate more efficiently. 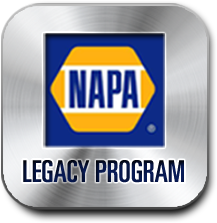 National Warranty: AITA Fleet Affiliates receive the NAPA Nationwide Warranty program on NAPA premium parts, allowing you to install quality NAPA parts in your shop with the confidence that if that part fails on the road, NAPA will help get you back on the road.